On October 17, the Russian national football team defeated the visiting English team 2 to 1at Moscow's Luzhniki Stadium in a qualifying match for the 2008 UEFA European Football Championship. The final whistle of Spanish referee Luis Medina Cantalejo was barely heard as 75,000 spectators cheered wildly. Millions of people who watched the game on TV also rejoiced; many of them hugged each other, sang, danced and took to the streets to celebrate the historical and quite unexpected success of the Russian football. The police reported several fights between supporters of the Russian and English teams in Moscow and arrested several dozen people for drinking and disorderly conduct. These were all minor violations compared to some other matches. It became clear that all tickets would be sold a month before the match. In a bid to fight scalping, the Russian Football Union decided to allow spectators to reserve tickets in advance. Although 750,000 people wanted to buy them, the Luzhniki Stadium seats ten times less. Several days before the game, thousands of people lined up in rainy weather at night so that they could buy one of the 6,500 tickets in the morning. The authorities took great efforts to protect the 4,500 British football fans in the Russian capital. They were taken to Luzhniki by buses and searched by policemen, before taking their seats at a grandstand surrounded by metal obstacles. Such tight security prevented clashes with their Russian rivals. The English team's grieving supporters were allowed to leave the stadium immediately after the match in violation of standard procedures, while many Russian fans had to wait for two hours before going home. However, they were not very upset because their team had won. 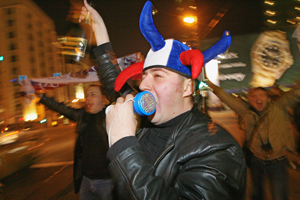 Nevertheless, several fights between Russian and English fans occurred at restaurants and on the streets of Moscow, and five British fans were even taken to hospital with minor injuries. England's Wayne Rooney scored a spectacular goal, while Gus Hiddink, head coach of the Russian team, chose his replacements wisely. Russia's Roman Pavlyuchenko scored two successive goals against Paul Robinson in five minutes. This unforgettable match is also noted for a referee scandal. Spanish referee Luis Medina Cantalejo enforced a violation by Wayne Rooney against Konstantin Zyryanov with a penalty. Video footage showed that the violation had taken place outside the English team's penalty area. Nevertheless, the Russian team received a penalty kick at the English goal. After the match, Steve McClaren, the new head coach of the English team, called Cantalejo's decision a disgrace and said it had broken his team's style. In addition, McClaren provoked an unprecedented scandal at a news conference after the match; he denied a lady interpreter's services and said he would only talk to British journalists. Russian reporters, many of whom speak English, said McClaren was extremely rude. None of the coaches who came to Russia allowed themselves such behavior. Most of the Russian journalists left the room in protest; and McClaren once again showed that he could not face defeat. Friendly games involving journalists and team supporters showed that the hosts played better. The Russian team's fans defeated their British rivals, who were striving for revenge for their defeat at Wembley, 6 to 5. The British journalists' team headed by former Liverpool player Jamie Redknapp lost 3 to 9 to their Russian colleagues. So, the trip to Moscow was an evident flop for the British.